Boulder Mountain Fire Protection District (BMFPD) is a volunteer fire department that serves an area in the mountainous Front Range area just west of Boulder, Colorado. 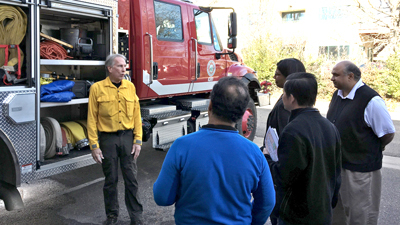 Recently, a team of four BMFPD firefighters brought an attack engine to the FirstNet Authority offices in Boulder. The purpose of the visit was to provide FirstNet Authority staff an opportunity to get hands-on experience with the gear, equipment, and communication tools typically used by firefighters in responding to structure fire incidents. BMFPD is an “All Hazard” fire/rescue department – meaning that it responds to just about all types of 9-1-1 calls – wildland fire, structure fire, medical, search & rescue, vehicle accidents, and more. The department has about 60 volunteer firefighters on the roster. These firefighters have various levels of qualifications in structure firefighting, wildland firefighting, and medical training (e.g. Emergency Medical Technician – EMT). They serve a mostly residential area that is forested with narrow mountain roads and limited broadband coverage that is subject to wildland fire, flooding, landslides, and extreme weather conditions. The BMFPD crew demonstrated the use of much of the equipment on the attack engine and then donned their “bunker gear” and self-contained breathing apparatus (SCBA) to explain how that personal protective equipment enables them to fight fire and do rescue work in burning buildings (e.g. 800˚F, smoke-filled, dark, no visibility). FirstNet Authority staff got first-hand experience with the difficulty of using radios while in bunker gear and working in structure fire conditions. Operating a radio with big, insulated gloves is difficult; understanding voice communication through a full face SCBA mask in a very noisy environment is even more difficult. If you do not already know what the interior attack team is likely to be saying, sometimes it is impossible to understand the radio traffic. Special emphasis was placed on providing communications among the various teams of fire fighters that must cooperate in a structure fire incident. FirstNet Authority staff participated in a scenario to learn about the number of different teams – sometime separated by distance and topography - that work together in a structure fire incident. For example, a recent structure fire in the BMFPD service area saw quick response from six different fire departments plus the sheriff’s deputies, an ambulance company, another emergency services support group, and other county services. After the familiarization with bunker gear, SCBA and various tools used by firefighters, the FirstNet Authority staff went back out to the fire engine. The Boulder Mountain Fire engineer started up the engine then activated the pumps and increased the RPMs to the level that would be needed to supply water to an interior attack team. In a typical situation the pumps would have to generate about 170 PSI to provide the appropriate hose pressure and amount of water needed. FirstNet Authority staff easily understood why the engineer needs to wear headphones to be able to hear radio traffic from the interior attack team (on the other end of the hose), the Operations Officer, and the Incident Commander. The engine noise is significant. Off-network device-to-device (D2D) communication (aka "direct mode" and "locally-routed path”/repeater for 4G techies) while out of cellular coverage will be a critical success factor for MCPTT adoption by firefighters, especially in rural mountainous regions. Challenges typical of many rural and volunteer departments were also discussed, including coverage and costs of devices. Overall, all participants appreciated the opportunity for the FirstNet Authority technical team and local firefighters to interact, get hands-on experience and share questions and concerns. Both FirstNet Authority staff and BMFPD firefighters are planning for continuing opportunities to learn from each other to meet the emerging communication needs of firefighters.